In December of 2016, students organized several “sanctuary campuses” across the City University of New York (CUNY) system, one of the largest university systems in the U.S. Reeling from the victory of Donald Trump, activists organized sanctuary “safe spaces,” working with university administrators to ensure that Immigration and Customs Enforcement (ICE) investigators would have limited access to background information, and to set up a system that reported harassment and intimidation of “undocumented” students. Disgust with the explicit racism of the current political regime is the basis for the sanctuary resistance across the U.S., with much of the work being done on campuses where undocumented students are at risk for losing scholarships and other financial resources. As an adjunct and activist/educator at CUNY for over 15 years, I was moved by the swift response by students who self-organized around an issue which continues to impact thousands of people. At the same time, I wonder if sanctuary-as-resistance holds radical potential beyond the defense of a vulnerable population. That is, from a revolutionary standpoint, what exactly is the current state of the sanctuary resistance movement beyond the pale of reformist activism? How does the precarity of the immigrant worker reflect some of the central labor practices of the corporatized university? Finally, how can we take steps to radicalize the concept of sanctuary to galvanize working-class consciousness both on and off our campuses? What is evident is that the sanctuary movement in its current formation acts as a buffer against the institutionalized political Right, and while this mode of resistance is not inherently flawed, it also forestalls the nascent potentiality towards revolutionary action. Specifically, that it is not just about Donald Trump or the Republicans, but rather consistent with how capital needs to manage and control the international working class, mainly through utilizing racism and anti-immigrant sentiment to divide exploited workers from super-exploited ones, particularly in this moment of capitalist instability. As Eszter Kovacs argues, the refugee crisis in Hungary and across Europe has produced similar effects in terms of anti-immigrant sentiment and rabid xenophobia, a problem ignored by and in some ways sanctified by the neoliberal state. Often left out of the sanctuary conversation, for example, is the extent to which the mechanism for incarceration and deportation were implemented by previous administrations (Obama, in fact, was labeled “deporter-in-chief” by immigrant activists), not to mention how the privatized prison industry has reaped massive profits off incarcerated immigrant bodies. To this extent, the systemic defect of the present manifestation of the sanctuary movement reflects the texture of resistance movements that have emerged in the last few years, such as the Arab Spring, with an overall emphasis on reformism over system-change. Firstly, the sanctuary movement seems put an over-emphasis on what the radical feminist writer Nancy Fraser calls a “politics of recognition,” which aims at resisting the false images of those who have been marginalized by the dominant cultural group. The identity model of political organization often displaces redistribution oriented forms of class-based struggle through working-class solidarity and internationalism. In the present context, sanctuary-as-resistance intends to reposition immigrant identify on an equal footing to the ethos of the “mainstream” society, a phenomenological approach that utilizes cultural sentimentality as the basis for political re-appropriation. The politics of recognition strategy of the sanctuary movement, ultimately, will only weaken our ability to cultivate class consciousness across the spectrum of those most affected by neoliberal restructuration and crisis. I will outline below how solidarity between undocumented students and other forms of exploited labor on our campuses holds significant potential for pushing beyond recognition politics and the centrality of identity-based oppression upon which much of the sanctuary movement is built. 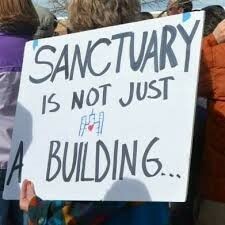 Another shortcoming of the existing sanctuary movement is its underlying nationalist flavor. Appealing to cultural nationalism does nothing except redirect the struggle for systemic change towards ballot-box complacency and pro-immigrant romanticism. This is not to suggest that anti-racism and anti-nationalism are completely missing from the sanctuary movement, nor is the politics of identity the sole ideological component in the sanctuary formation. Rather, if the primary focal point of the movement revolves around a nationalist-based identity politics that idealizes the immigrant experience, then it will likely fail to multiply the antagonism against the vile forms of racism and xenophobia that have bubbled to the surface under Trump and other leaders like Orban nor will it broaden the potential for radicalization. Furthermore, if nation states like the U.S. in the grip of capitalist crisis supplementing the go-to mechanisms of economic austerity in favor of repressive tactics in the struggle to maintain control over working-class consciousness, then the building of an anti-racist network across the spectrum of alienated labor is pivotal. Contrary to the focus on the politics of identity and recognition, which sets “more oppressed” workers in opposition to purported “privileged” ones in the attempt to elevate the immigrant experience to the level of mainstream acceptance, anti-racist politics draws attention to how structural racism divides exploited workers from super-exploited ones. It emphasizes racism as central to the process of economic dispossession, wealth extraction, and unequal class divisions, especially in the context of capitalist globalization, which has fashioned new forms of virulent xenophobia to manipulate working-class consciousness so that it adheres to fictionalized and manufactured nationalist and ethnic boundaries. Consequently, we can see also how enforced labor immobility harmonizes with neo-fascist ideology, and therefore is essential to the success of contemporary imperialist practice. According to John Bellamy Foster, the neo-fascist Gleichchaltung under Trump intends to reestablish control over political, military, and ideological apparatuses to eliminate social heterogeneity and dissent, a synchronization of composite forces so that they realign with the totalitarian agenda. As Foster argues, “neo-fascism” shifts towards managing the “advanced capitalist system” and requires “the effective dissolution of the liberal-democratic order and its replacement by the rule of representatives of what is now called the ‘alt-right.” The ultimate objective of the neo-fascist agenda under Trump, according to Foster, is to reassert US hegemony over global economic forces and to squash working-class revolt against the ongoing systemic crisis of capitalist globalization, especially in the global South where workers are organizing militantly against the brunt of the neoliberal onslaught. In other terms, the current phase of neo-fascism is a direct and logical outcome of the neoliberal agenda and its concomitant crisis, necessitating and employing overtly repressive mechanisms to manage working-class consciousness domestically, to maintain the system of brutal super-exploitation of southern labor, and to ensure the continued dominance over capital flow from the global South to the owner-class mostly located in the imperialist centers. Understanding how xenophobic racism is consistent with neo-fascist re-appropriation and management is key, if we are to build a sanctuary movement that not only recognizes the humanity of the undocumented worker, but also moves towards dismantling systemic racism and economic deprivation, which affects all workers globally. What should be emphasized in sanctuary work to shape the kind of radical collectivity that will endure beyond the confines of institutionalized politics and into modes of working-class internationalism and anti-imperialism? Such a position needs to push beyond the politics of identity, nor is it only about what Manuela Zechner and Bue Rübner Hansen call “integration beyond coercion,” which aims at creating safe spaces for refugees within the confines of already-defined national boundaries. To clarify my perspective here, let us take some cues from what Tihi Bhattacharya calls “the relationality of struggle,” or how cultural and economic organizational demands interrelate. As Bhattacharya argues, “Capitalism does not just produce commodities, but in order to do so in continuous sequence, it also needs to reproduce capitalist social relations. But every site of reproduction is a doubling where twin possibilities exist: that of reproduction of existing relations and the interruption of such relations.” Similar to Nancy Fraser’s emphasis on political redistribution, what Bhattacharya emphasizes is how “new” forms of social resistance emerge out of economic demands, culminating in political reconfigurations that can deepen radical collectivity in the push for revolutionary change. To situate her remarks here: does the sanctuary movement simply reproduce a version of capitalist social relations or is it disrupting the mechanisms upon which capitalist exploitation thrives? If the answer is the former, then how can it be formulated accordingly so that it can in fact challenge that these social relations, and even more succinctly, what would it mean to organize a radicalized form of the sanctuary movement that cultivates the politics of relationality to which Bhattacharya subscribes? To answer these questions within the limited space here, let us focus on how such work can be fortified on our campuses. The first thing to assess in this sense is the state of what is termed “adjunctification” in the context of the neoliberal university structure. The reliance on what Marc Bousquet labels the “intellectual proletariat” is not simply a tendency within the neoliberal university; rather, it is essential to the organizational success of capitalist globalization, as labor casualization is utilized to fragment solidarity and spread anti-unionization ideology across the spectrum of the globalized working class. This has become normalized under the regime of the corporatized university where the majority of teaching is done by underpaid intellectual workers whose place in the university structure is based on perpetual contingency. At the City University of New York, over 60 % of the faculty are adjuncts, a trend which reflects the state of higher education teaching both nationally and internationally. Combined with the intensification of labor by an increasing administrative class against faculty interests, the neoliberal model has severely weakened labor solidarity between adjunct labor and the residual full-time professoriate who have been forced into retreat mode. In the global South, labor precarity is also normalized as a strategy to disarm working-class organization and to intensify super-exploitation of labor-power, creating a vast reserve army of labor without the ability to reproduce themselves daily, and often driving migrant labor to the global North. While the character of the exploitation differs, the dependence on precarization is what links adjunctification to immigration, as both populations become subjected to capital’s desire to sustain higher levels of value-extraction, and to reproduce a compliant and submissive labor force. Similarly, the neoliberal university thrives upon the exploitation of an intellectual proletariat who do most of the grunt-work teaching cash-cow courses, and whose liminal existence thus becomes subordinate to the necessity of profit. In general, both sets of workers are also lulled by temporary states of security either through provisional work visas or through the feigned acceptance of the adjunct persona in the space of the wider academic community. The point is, by organizing across the gamut of exploited labor on our campuses, we may be able to cultivate the dynamic of collective opposition against the everyday reality of capitalist exploitation and inhumanity. Despite mass corporatization, the university space still offers an opportunity for building commonalities of struggle in a public sphere, as Henry Giroux accentuates in his important work on the question of pedagogical resistance. Emphasizing labor solidarity through internationalism represents one way to break the cultural abstraction that legitimates the liberal-reformist/nationalist paradigm of the sanctuary movement, which utilizes identity as the basis for political organization. Class-based internationalism, coupled with an accentuated focus on recognizing the plight of the super-exploited and vulnerable population within the sanctuary movement, can also dismantle the liberal rhetoric embedded in university policy whereby a de-politicized internationalism is transformed into a vulgarized and celebratory cosmopolitanism, a realignment that in turn satisfies the neoliberal appetite for a transnational approach to labor management. If agency is reduced to a cultural exercise, it ignores the possibility of pedagogical praxis as a form of political struggle waged in the name of building edifices of social justice that can challenge the systemic logic of exploitation, both inside and outside of the academy, particularly in a time of the neo-fascist counter-revolution. Radicalizing sanctuary via anti-racist internationalism can only build confidence in the working class at the point of production, while also furthering the cultural struggle the neo-fascists and their liberal underwriters who are equally to blame for the climate of catastrophe that is unfolding before us. 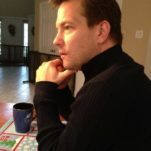 John Maerhofer is an educator and activist based in New York City. An adjunct for over 14 years. he teaches English and interdisciplinary studies at the City University of New York. His article on the Maoist Movement in India and the global insurgency is forthcoming in International Critical Thought. His book, Rethinking the Vanguard, was published in 2009.